After constant debate as to which goaltender should start Game 1 for the Calgary Flames, it was Mike Smith who got the call… and he answered. Smith, who put together arguably his best performance of the year, carried the Flames on his back to a 4-0 shutout victory over the Colorado Avalanche on Thursday. 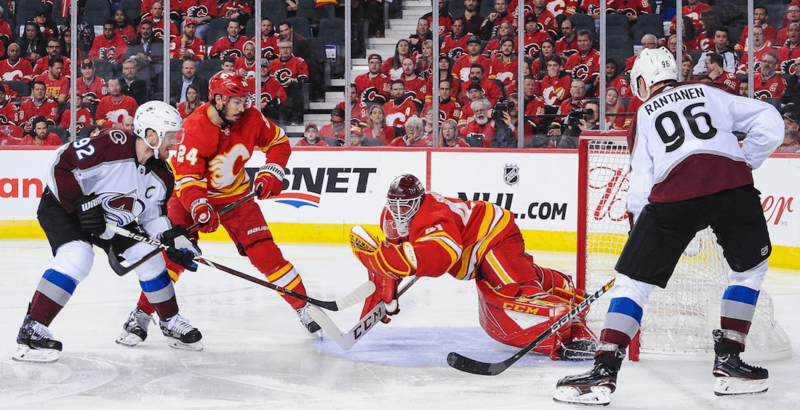 The goaltender came up huge time and time again in front of a raucous crowd at the Saddledome, amassing 26 saves and earning his fourth career playoff shutout – his first as a Flame. To go along with Smith’s big night, Matthew Tkachuk potted two goals, while Mikael Backlund and Andrew Mangiapane added one a piece. The win marks Calgary’s first playoff win on home ice since 2015. Smith’s stellar play drew multiple ‘Smitty’ chants throughout the night and resulted in his name trending across the country on Twitter. After the game, Smith told the media that the uplifting chants were something he has never had over his 13 years in the NHL. There were many questions surrounding who might start in the crease for the first game of the series with the emergence of David Rittich, but after Smith’s huge performance, there will be no doubts who is in the crease to start Game 2. As stellar as Smith was during Game 1, however, it was Mangiapane who possibly notched the highlight of the night. The rookie made a sweet deke to his backhand and managed to slide the puck in past a sprawling Philipp Grubauer for the game’s first goal. Calgary now leads the best-of-seven series 1-0 and will be back in action for Game 2 on Saturday at the Saddledome.